Supra LoRad SW-EU/A 90 Degree Angled Schuko EU Plug. 16A Schuko. Maximal current 16 Ampere. 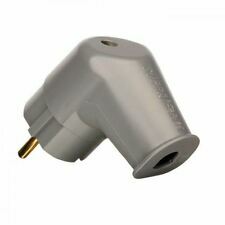 SW-EU/A 90-deg Angled Male Plug Features. SW is a series of mains plugs for 110-240V, safety approved Hospital Grade and Audio Grade. The Supra SWF-10 is a high quality IEC connector for terminating mains cables. Designed for electronics with IEC sockets rather than those with "Figure 8" sockets. 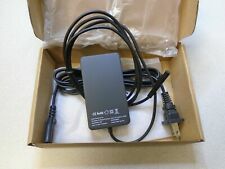 Priced individually..
Power Supply for Microsoft Surface | Free Shipping!!! 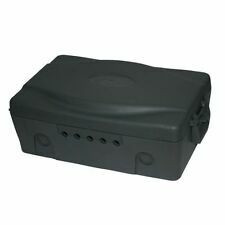 Masterplug Weatherproof IP54 Outdoor Electric Socket Junction Box Garden Power. Brennenstuhl Comfort-Line Kabelbox CL-S 4-fach schwarz/weiß 3m 1109220. Comfort-Line Kabelbox CL-S 4-fach schwarz/weiß 3m H05VV-F 3G1,5. Brennenstuhl Comfort-Line Comfort-Line Kabelbox CL-S 4-fach schwarz/weiß 3m H05VV-F 3G1,5. 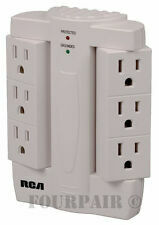 RCA 6-Outlet Swivel Surge Protector. By plugging right into your wall outlet, the slim space-saving design manages & organizes cords off the floor and in tight spaces. Surge Protection up to 1200 Joules. Vintage Memorex Power Center Surge Suppressor TVSS1449 Tested Works Great!. Condition is Used. Shipped with USPS Priority Mail. Tacima TC416/BP 6 Way Switched Surge Protector 2M Advanced Surge Protection System. The Ex-Pro 6 Way Mains Conditioner Power Strip contains a powerful mains conditioner and radio frequency interference filter especially designed to help reduce mains interference. Geist SP104-10 19" Rack Mount Power Strip rated at 15amp 125VAC with Surge Prot. Up for consideration is a Geist Model SP104-10 19" Rack Mount Horizontal Power Strip rated at 15amp 125VAC with Surge Protected circuits. This is a 10 outlet strip with a 10' power cord that was mounted for a project but never put into service. This is a high quality EU mains plug from Supra. Ideal for terminating Supra mains cables, as well as any other mains cables that require a high quality termination. Priced individually.. When your appliance switches to standby, standby shutdown automatically cuts off mains power. Automatic Standby Shutdown. Leutron EP C TN 275-D Surge Arrester - Type 2 Class 2. Suitable for single phase 230V AC TN supply. 3 module width & DIN rail mountable. Suitable for protecting incoming supply to domestic/industrial single phase supply, making installation 18th edition compliant. Protects against transient overvoltages. Can be installed in series up to 16A or in parallel with unlimited current rating. Not a cheap device like many now coming on the market. Leutron have been making these devices for a long time now and the well built German quality is as good as it gets! Brand new in box. Grab a bargain as RRP is £180! Tripp-Lite line conditioner, 120 volt, 600 watt capacity. Output is 120 @ 60 cycles. Protects against spikes and brownouts. I bought 6 of these for a computer room redo but wound up only needing 5. Bachmann SMART 6x Schuko H05VV-F 3G 1.50mm² 16A/3680W 3m power extension 6 AC outlet(s) Black. Bachmann SMART 6x Schuko H05VV-F 3G 1.50mm² 16A/3680W 3m. Cable length: 3 m, AC outlets quantity: 6 AC outlet(s), Product colour: Black. Brennenstuhl BN- - Power StripEco-Line 10-way power extrention with switch black. Eco-Line 10-way power extrention with switch black. Brennenstuhl BN- - Power Strip. Cable length: 3 m. Cable colour: Black. Compliant with BS1363/A this extension lead is also wall-mountable using the keyhole slots in the back of the unit. Lead length 2.0m. Product Weight : 376 grams. current 13A. They keep your entry-level computers and peripherals protected from power surges, spikes, and lightning strikes. This SurgeStrip provides basic protection in a white, hard-plastic casing sure to blend well with a number of gaming and peripheral devices. Surge Protected up to1140 Joules. Master On/Off Switch with 15Amp resettable circuit breaker. Surge Protection: Up to 1140 Joules. Circuit Breaker: Resettable (built in switch). Outlet Spacing: 3¾" or 95mm (center to center). Supra spent over five years in research and development for this LoRad shielded mains cable, LoRad is a CE-approved audio grade replacement mains cable. The benefits of LoRad have been established for some time now - as the cable is one of the few available worldwide that is fully CE approved. The main benefit is the shielding which helps to ensure that other low level signal cables are not affected by the close proximity of the LoRad mains cable - induced RF interference has been one of the biggest bug-bears of high quality audio and video reproduction and so by equipping one's hi-fi or AV system with LoRad, you should both see and hear a difference. Huge saving by building it yourself. This cable sells for £72. SURGE CAPABILITY 90 JOULES. SURGE SUPPRESSOR. Russian to UK extension lead. After product review that this item was heavy we have changed the spec to a shorter 1m lead and now use slimline white sockets, which has reduced weight to 265g. It is fully earthed and tested. Masterplug SRPMSTU81PB2 Surge protected USB Power Bars are ergonomically styled with smooth lines for an attractive yet traditional look. Masterplug stands by the quality of its Surge products. Masterplug 1m 8 Socket Surge Protector with 2 USB's Black. V7 Power CABLE UK COMPUTER 2M. 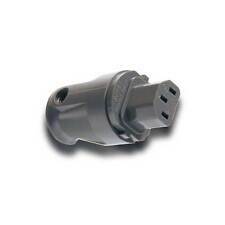 V7 Computer AC Power Cable UK Plug to IEC-C13 black 2m. Cable length: 2 m, Connector gender: Male/Male, Connector 2: C13 coupler, Cable colour: Black. V7 Power CABLE UK COMPUTER 2M2 m.
Item model number: P6W. The APC SurgeArrest Wall Surge Protector turns a standard AC wall outlet into a 6-outlet surge-protected powerhouse! Side-Facing wall outlet for clean look. Center screw firmly mounts unit on the wall, or can be removed by gently lifting off the red washer on the back of the unit. Poweradd Extension Lead 4 Way Outlets 5 USB Ports Power Strip Individual Switch 1.8M Cords with 3500J Surge Protector Socket, UK Plug Adaptor, White. Efficient and fast smart USB ports will automatically match the maximum charging current for your devices(Each one 5V/2.4A,total 5V/8A 40W). TRIPP LITE. SURGE PROTECTOR. 2 USB CHARGING PORTS. 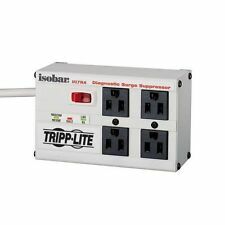 New Tripp lite 12 outlet 30 amp Power strip with surge protection S361220. Condition is New. Shipped with USPS Priority Mail. Max Output 4 USB Ports - DC5V - 4.2A Max Surge Protection - SPD3 VPR: 900V 300J. Überspannungsschutz für Antenne (Koax). Belkin SurgeMaster Steckdosenleiste mit Überspannungsschutz. 7 Steckdosen mit Überspannungsschutz, davon 1 ungeschaltet, die anderen 6 über Ein/Aus-Schalter. Überspannungsschutz für Netzwerk (RJ45). Supra spent over five years in research and development for this LoRad shielded mains cable, LoRad is a CE-approved audio grade replacement mains cable. The benefits of LoRad have been established for some time now - as the cable is one of the few available worldwide that is fully CE approved. The main benefit is the shielding which helps to ensure that other low level signal cables are not affected by the close proximity of the LoRad mains cable - induced RF interference has been one of the biggest bug-bears of high quality audio and video reproduction and so by equipping one's hi-fi or AV system with LoRad, you should both see and hear a difference. Huge saving by building it yourself. This cable sells for £66. APC SurgeArrest Essential Series 1080 Joules. All outlets are Surge Protected. Bachmann 3x Schuko H05VV-F 3G 1.50mm² 16A/3680W 3m power extension 3 AC outlet(s) White. Bachmann 3x Schuko H05VV-F 3G 1.50mm² 16A/3680W 3m. Cable length: 3 m, AC outlets quantity: 3 AC outlet(s), Product colour: White. Schaltbare 6 fach Steckdosenleiste mit Kindersicherung. Wir brauchen es wohl doch nicht so richtig. Die Ware wird unter Ausschluss jeglicher Gewährleistung verkauft. Der Ausschluss gilt nicht für Schadenersatzansprüche aus grob fahrlässiger bzw. MODEL NUMBER:ISOBAR4ULTRA. 4 NEMA 5-15R outlets in exclusive isolated filter banks. 6 ft. AC power cord with right-angle NEMA 5-15P plug. Brand new MTL SD32X Surge Protection Device. Listing is for 1 unit. 4 available in total. Was fitted inside an enclosure but the enclosure was never installed and has since been dismantled, hence these are now available for sale. Nominal working voltage of 32V, so suitable for 12V or 24V DC control system wiring. Full specification can be read in the image. Intrinsically safe! Ex rated in Class 1, Groups A, B, C & D. Grab a bargain. Cable length: 3 m, AC outlets quantity: 6 AC outlet(s), Product colour: Grey. Depth: 410 mm. Cable colour: Black. Number of products included: 1 pc(s). Brennenstuhl power extension 3 m 6 AC outlet(s) GreyStrip - 3 m.
Brennenstuhl 1390007009. Cable length: 2 m, AC outlets quantity: 9 AC outlet(s), Product colour: Aluminium,Black. Maximum current: 16 A. Cable colour: Black. Brennenstuhl power extension 2 m 9 AC outlet(s) Aluminium,BlackAlu-Line 19" Extension Socket f/ Cabinets - 9-Way - Alu/Black - 2m - H05VV-F3G1,5 - w/o Switch.